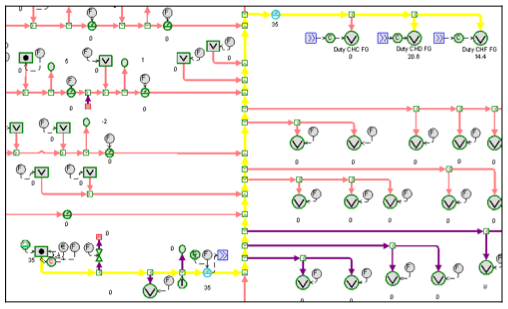 The model is also used in standalone mode to perform case studies for economical evaluations of potential investments and for planning the operation of the energy system. Greenhouse emissions are also taken into account. After a description of the energy system and the project objectives, the methodology and the project steps are commented. Several examples about the scope and application of the optimization system are also presented. TOTAL is a multinational energy company committed to leveraging innovation and initiative to provide a sustainable response to humankind's energy requirements. It is Europe's leading refiner-marketer operating 12 refineries directly in Western Europe. The reduction of greenhouse emissions and the enhancement of energy efficiency are among the Company corporate challenges. TOTAL operates a large and complex energy system at Feyzin refinery, in France. After a feasibility study and visits to current users of the application (Ref. 1, 2, 3), TOTAL decided to test an on-line model for site wide energy system management. After a description of the energy system and the project objectives, the methodology and the project steps are commented. Several examples about the scope and application of the optimization system highlighting important aspects are also presented. Refineries and large petrochemical complexes usually operate complex energy systems. For example, they use different kind of fuels, produce and consume electricity, have several steam pressure levels, feed different types of consumers and there are emission limits (NOx, SOx) to be observed. In addition, the Kyoto protocol introduces a new motivation for industry to reduce CO2 emissions in many countries, with particular consideration given to the CO2 emission cost and how it should be taken into account when managing energy systems. In general, these complex energy systems have several degrees of freedom. Manipulating these degrees of freedom with a cost based optimization program usually can result in significant savings in operating costs. This is particularly important within current deregulated electrical markets or in process of deregulation, and also in a world scenario of increasing fuel prices. Since the electrical system is one of the main economic trade-offs with the steam system, electrical deregulation provides many new challenges to operate the overall combined system at minimum cost. Other important aspects are that utilities systems are continuously evolving (changes are frequent) and that also, sometimes, there is a lack of sensors that needs to be addressed properly. Finally it is important to mention that traditionally, given the complexity of the system, the optimization of the utilities is managed at the level of each refinery operating area. But the optimization of individual, isolated areas, does not necessarily obtain the true global refinery optimum. The main objective of the project is to build a validated energy system model for the site to be used for energy real time optimization, CO2 emissions management, utilities balances and accounting, and instrumentation improvements. Such a model is also used for evaluations of operational changes, shutdown and startups, and load-shedding ("delestage") taking into account both the technical and economical impact on the energy system. Furthermore, capital investment projects evaluation is performed by using the model. Feyzin refinery steam network has four pressure levels. There are three fired boilers and two steam turbogenerators. The following figures show some views of the model graphical user interface. After data collection and control system review, a detailed model of the energy system has been built and it is populated continuously with on-line, validated (not reconciliated) data. 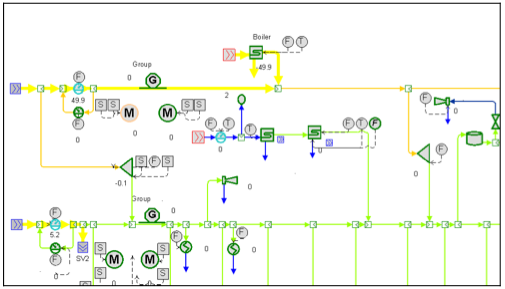 The model is connected to the Plant Information system via standard OPC interface. At that time, the training at engineering and users' level is performed. Then the model fine adjustment and optimization results analysis is performed on daily basis. Minor model modifications and the addition or adjustment of constraints is done. Each one of the several hundreds sensors included in the model is configured with the necessary decisions on what to do with the sensor and the model in case of measurement errors and bad values. The following figure shows an example of the sensor configuration options. The methodology for model validation is based on getting inaccurate meters fixed. 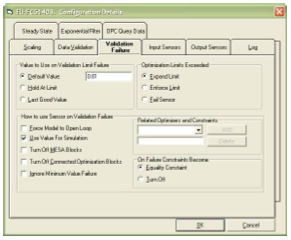 The operators can visually identify sensors with data validation problems because their background color changes in the model schematic. Even after validation is passed, it is usual not to have perfect mass balance closures in utilities system. This is inherent to utilities systems due to the plant data nature, the modeling assumptions (nominal steam usage for pieces of equipment where no measurement is available). This offset is then held constant for optimization or case studies (considered as an unmeasured load). Big balance offsets are visually identifiable (the size of the balloon increases). Either visually or with the aid of an easily generated Excel report, these large imbalances are flagged to the user who can then focus maintenance attention on the meters that are part of that balance. If the meters in the balance are particularly important, the software can be configured to automatically shut down optimization choices to which they are related or even shut down the entire site optimization. The following Figure shows an example of the balloon location. 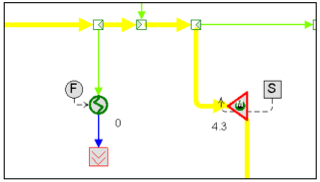 The model includes all the actual operating decision variables and constraints for the energy system operation. Although optimization movements are performed typically on a daily basis, optimization recommendations are continually available for the user, since the model is executed automatically at a given frequency. Choice of the use of an FCC slurry stream (either to produce steam or to preheat the feed to a vacuum unit). As a result of the optimization, the utilities demand from the overall site Units is always satisfied at minimum overall cost. Besides optimization, performance monitoring is also done, since the model runs automatically as a service writing back its results to the Real Time Data Base (Plant Information system). It also provides reliable data that helps to audit the energy productions and usages within the site energy system, and in that way wastes can be detected and eliminated. The model is also used in standalone mode to perform case studies to plan the optimal operation of the energy system under new scenarios and to evaluate the economic impact of investment projects. 5.6. Importance of measurements for the on line models. The most important sensors are the ones directly involved in optimization. In the cases of pieces of equipment where there are no direct measurements, these may be inferred using another measured value (i.e., using valve openings for the letdown valves flowrates). 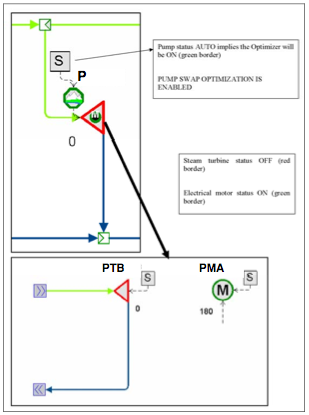 Pump on/off status, especially for pumps that are directly involved in the optimization, are being determined automatically. With regards to being able to apply the optimizer recommendations, the information related to the availability of equipment is very important. This data is not usually available in the distributed control system. The control system and the model can know if a steam turbine is ON or OFF, but if its status is actually OFF, it is not straightforward to determine if it is available to be turned ON or not. At TOTAL Feyzin, an innovative third way has been implemented to detect the availability for pump swaps. If the DCS signal is AUTO for a driver (i.e., steam turbine) whose status is OFF, it means that it can be automatically turned ON if the corresponding other driver (i.e., electrical motor) shutdowns. From the point of view of the availability of that driver, in the above example the steam turbine, the AUTO signal implies that the equipment is available to be considered as a candidate to be turned ON for optimization purposes. If the corresponding DCS signal is MANUAL, it means the driver will not change automatically its status (from ON to OFF or vice versa). For example, MANUAL/OFF could mean that the equipment is under maintenance (out of service). In case one of the elements under an optimization pair is found to be in such a state, the whole optimization pair will be automatically disabled. The following Figure shows an example of pump swap availability detection. CO2 emissions cost is taken into account in the model together with all the other purchase and supply contracts of fuels, water, steam and electricity, in accordance to Kyoto protocol and French legislation. 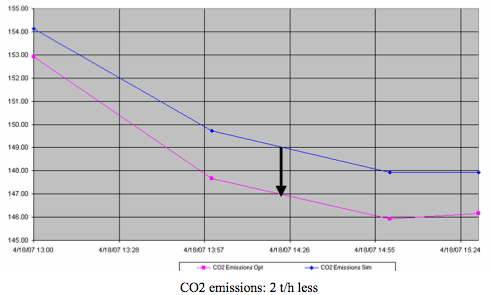 As a result of the optimization recommendations, a reduction in CO2 emissions is generally observed. For each emitted ton of CO2 a price equal to the emissions allowance price is assigned (plus the applicable taxes). This approach is not fully realistic from the accounting perspective, unless the plant has currently exceeded the CO2 emissions quota. However, it assures that the optimization will be always focusing on minimizing CO2 emissions. This approach may influence the optimization results in those cases of compromise between using a more expensive fuel with a low CO2 emissions factor and a cheaper fuel which produce more CO2 emissions. No price is assigned to the emitted CO2 until the quota is achieved. 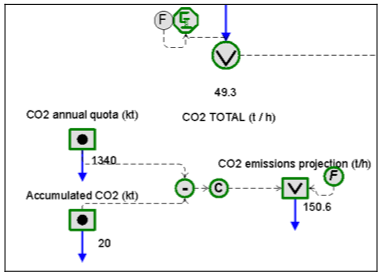 In this way, if there were compromise solutions between the use of a more expensive fuel with less CO2 emissions or a cheaper one with more emissions, the optimization would push for the second until reaching some other constraints, and consequently the quota achievement would be fulfilled earlier. This approach should be only applied in those plants where, due to operating conditions, the annual emissions quota is unlikely or far away to be achieved. The CO2 emissions have always an associated incremental price; however this price will depend on the emissions projection for the rest of the period (one year). 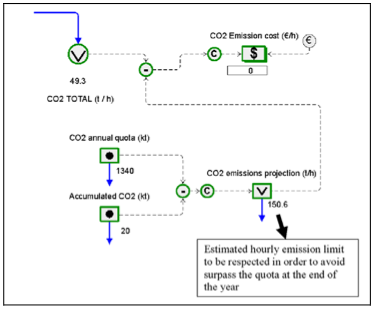 If this projection of emissions foresees that at the end of the period the quota will not be reached, each ton of CO2 below the quota will have a negative price (-) equal to the price of sale of the emissions rights, which for optimization purposes will correspond to a credit (assuming this emissions rights not used will be able to be sold). If the projections foresee the quota will be reached and surpassed, the price will be equal to the cost of emission (plus the applicable taxes). In all cases a restriction can be imposed over the instantaneous CO2 emissions flow to be equal to the projection of the hourly emissions calculated in order to exactly reach the quota at the end of the period (end of the year). This approach would help to manage the fuels consumption to be always below the emissions quota but taking full advantage of the emissions quota during the whole period. However, once the quota has been exceeded (for example, due to an unexpected high fuels consumption need due to a big Unit upset), the additional CO2 emissions cost will be included again in the Objective Function to be minimized. Under this scenario the price of each ton of emitted CO2 will be equal to the CO2 emissions allowance (plus the applicable taxes). 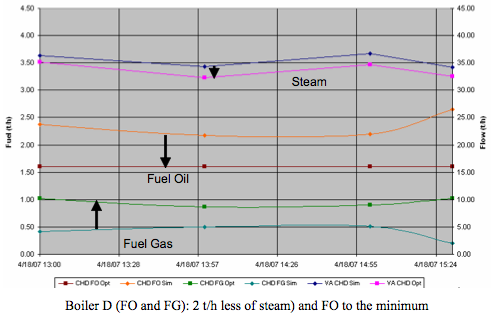 TOTAL Feyzin refinery is working in CO2 emissions reduction following the alternative (a) described above. As a result, the change made by the Fuel Gas control system is translated to a Natural Gas import increment. 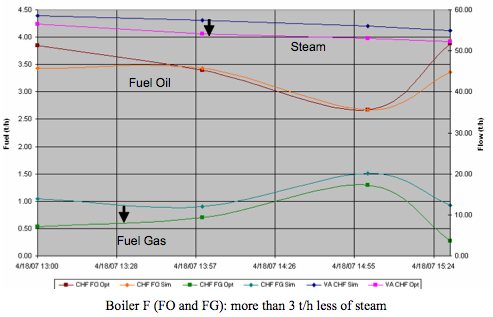 The following figure shows the fuel gas network model representation highlighting the differences between current and optimized situation (delta view). As a result of replacing FO by FG (by importing more Natural Gas), CO2 emissions are reduced in 4.7 t/h. This is important to be considered when there is a trade-off between cheaper fuels that produce more CO2 and more expensive fuels that produce less CO2. This is very important when CO2 emission quota is expected to be surpassed at the end of the year. This example corresponds to the evaluation of the technical and economic impact of a shutdown of a process boiler. 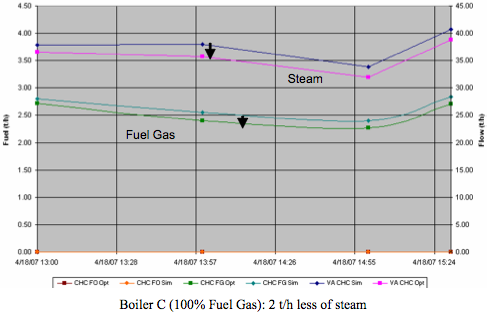 The objective of the study is to find the optimum way to operate the energy system (i.e., minimum cost) when the process boiler is shut down. Working with the model in Stand Alone mode, after being loaded with the current operation values through the real-time data base connection, the optimization was run and the optimum results were selected as the base case for further comparison. Then, the process boiler was stopped manually to simulate the future case and finally Visual MESA was executed again with the balloons locked (to maintain the same imbalances than in the base case). 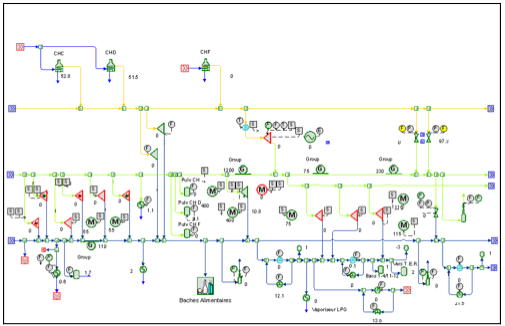 The following Figure shows the delta view of part of the process plant area where it can be seen the almost 50 t/h of high pressure steam that will be lost in the system when the process boiler shutdowns. The optimum recommendation for the evaluated case includes changes in the fired boilers load and some pump swaps (see the following figures). 7. Coordination among plant areas. Besides other practical issues usually found in large complexes it is necessary to mention that operators are generally not concerned about global energy costs reductions (i.e., Refinery Wide) but only about the Unit(s) under his/her direct responsibility. Many times, there is more than one responsible at the site (serving different areas) which translates into difficulties in the application of site wide coordinated strategies to reduce overall energy costs. Coordination among plant areas in order to implement the proposed optimization recommendations becomes a critical issue, so management involvement is very important from the point of view of engineering and operating staff roles definition. It is certainly a key aspect to ensure the reduction of site wide energy costs. At TOTAL Feyzin refinery the utilities manager is responsible for coordinating the optimization implementation on a daily basis. TOTAL Feyzin refinery is testing an on line model for site wide energy management. 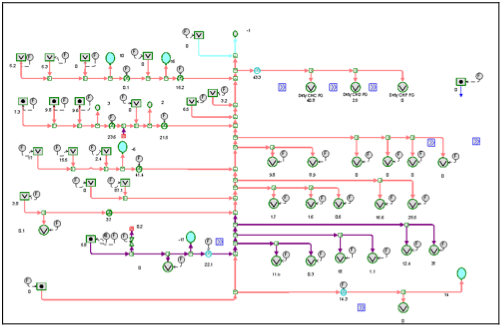 A detailed model of the energy system has been built including all site constraints. A continuous auditing and performance monitoring is also done. The model is used also in standalone for case studies, such as planning of shutdowns or new investments. Greenhouse gases emission reduction is contemplated by the developed model. Optimization is configured to give recommendations to operations personnel on a daily basis. 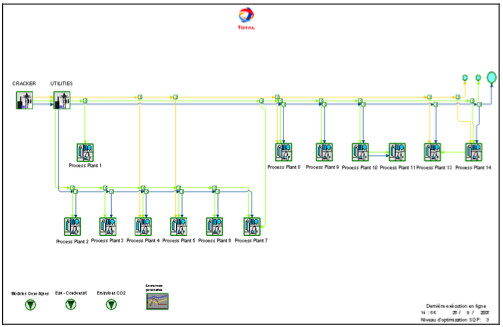 Since the coordination among plant areas is a key aspect for the successful application of the optimizer results, the utilities manager was the indicated person to do so. "Auditing and control of energy costs in a large refinery by using an on line tool", Ruiz D., Ruiz C., Mamprin J., Depto Energías y Efluentes Petronor, (2005), ERTC Asset Maximisation Conference organized by Global Technology Forum, May 23- 25, 2005, Budapest. "Energy Costs Reduction By Using an On Line Utilities Optimization Tool", Ruiz D., Ruiz C., Nelson D., Roseme G., Lázaro M. and Sartaguda M., (2004), ERTC Computing Conference organized by Global Technology Forum, May 17-19, 2004, London.